Cruised up to Mt Bachelor this morning to take advantage of the new snow. 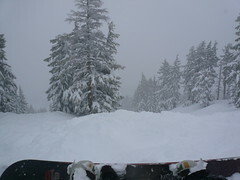 The powder was so deep today, there was no alternative but to lean way back and point the board nose downhill. There’s something about gliding down a slope in deep fresh powder that puts a smile on my face (even now, just thinking about it). A great day on the Mountian for sure.